Tales from Topographic Oceans is the sixth studio album by British progressive rock band Yes. It is a double album, released on Atlantic Records in December 1973 in most of the world and in January 1974 in North America. According to the documentary Classic Artists: Yes, Jon Anderson was originally going to call the album Tales From Turbographic Oceans. He mentioned the title while having dinner with Atlantic CEO Phil Carson, who noted that "turbographic" sounded like "topographic". Anderson liked the word and changed the album title accordingly. Tales from Topographic Oceans was recorded in studio 3 of Morgan Studios at the same time heavy metal band Black Sabbath was recording their fifth album, Sabbath Bloody Sabbath, in studio 4. According to Sabbath lead singer Ozzy Osbourne's 2010 autobiography I Am Ozzy the band decorated their recording studio with model cows–complete with electronic udders–bales of hay, and a small barn, to give the room an "earthy" feel. The album's concept, a two-disc, four-piece work of symphonic length and scope (based on the Shastric scriptures, as found in a footnote within Paramahansa Yogananda's book Autobiography of a Yogi), was their most ambitious to date. The four songs of the album symbolise (in track order) the concepts of Truth, Knowledge, Culture, and Freedom, the subjects of that section of text. According to drummer Bill Bruford in his autobiography (p. 72), former King Crimson percussionist Jamie Muir introduced vocalist Jon Anderson to Paramahansa Yogananda's work during Bruford's wedding in March 1973, and therefore had an indirect impact on the album's concept. On release it received notably hostile reviews. Gordon Fletcher in his review in Rolling Stone described it as "psychedelic doodling". 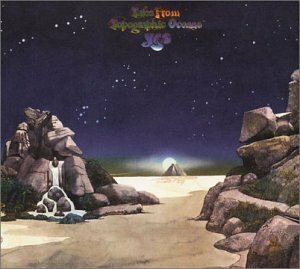 Despite acquiring a reputation as an example of the worst excesses of "prog rock", Topographic Oceans became the band's fourth consecutive gold album. The album reached #1 in the UK as well as reaching #6 in the U.S. during a chart stay of 27 weeks; the album even went gold in both countries from advance orders, before any fans had ever heard the content. A special promotional only, white label, "banded for airplay" version of the 2 LP set was sent to US radio stations by Atlantic Records in 1974 (the date is 1973 on the record labels.) This was done to try to increase radio exposure, as most radio stations did not want to air such long songs. This promo release divided the long tracks into 4 or 5 segments per side. Most of the segments were in the range of 3 to 5 minutes, and all were clearly marked on the record to assist disc jockeys. This promo version is now a rare collectible.